I was raised in a family of educators and musicians. My dad played the trombone, was the director of a high school marching band, and eventually became a high school principal. My mom sang in choirs, performed professionally and was a district language coordinator. As a little girl, not only did my mom take me to all her choir practices, she also took me to her private voice lessons. I also frequently attended Friday Night football games and was the “little darling” of my dad’s high school band members. It was an enjoyable time to be surrounded by all this musical creativity, but sometimes it felt like sensory overload. As the oldest sibling, I guess I was sort of a “creativity” experiment. So no surprise when my parents decided that at 5 years old I would take not only dance lessons, but a few years later, piano lessons as well. This dual performing arts focus took on new meaning, however, when my dance lessons branched out to include spanish flamenco dance as the third performing arts experience. I was only about 10 years old and already feeling exhausted. During this time, not only was I performing with dance troupes and learning to play sonatinas, I was also expected to excel in school. Oh, and did I share that I was also taking tennis lessons? As you might expect…something had to give. And it did. The turning point in this creativity experiment was when at about 12 years old, I finally threw up my hands by refusing to play tennis and quitting playing the piano. It was a sad choice as I really loved the piano, and I can remember it like it was yesterday. I was tired, though, and overwhelmed. Not a good place for a child to be. Thankfully my parents understood, even though the dance performance would continue for at least 10 more years. In college, I started my own “creativity experiment” by adding opera training to my heavy course load as a pre-service teacher, much to the dismay of my parents. Nevertheless, I was now in charge of my own destiny and soon discovered that I had to make a choice between my creative pursuits and my teaching career. Or did I? 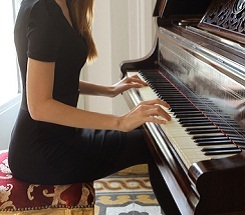 Fast forward to my time as a teacher – and then as school principal – when I discovered that I missed the times when I could sing, dance and play the piano. The creative spirit in me had somehow been silenced while I worked hard to share my passion for teaching and learning with students and teachers that I served. The joy I derived from my creative pursuits was missing and I knew that I had to get it back. Why had I stopped pursuing my creative passions? While this pursuit of creativity seems like another layer of work, it’s actually what we need as educators to support us in achieving balance! What is your creative passion? Take a minute to think back to the times you danced, painted or played an instrument. It’s time to dust off that saxophone case, fix that guitar string, tune up the piano and get down to the business of playing again. Paints and brushes all dried out? Save up and buy new ones! Drawing pad yellowing? Take a ride to your closest art store and just browse the aisles. Are the materials calling to you? Maybe your passion isn’t in the performing arts at all. Maybe you used to love to bake cakes, or build clocks. Think of the joy it could bring you to rekindle that “old creative flame”. And keep in mind that it doesn’t have to be all-consuming. Just take it slow and imagine yourself dancing to the tunes that once made you feel unstoppable. Wouldn’t it be great to feel that way again? This year, I’ve set a goal for myself as an educator to be more creative in my work. I’d even like to add learning to play the cello to my list of goals. I’m not really sure how I’ll do this yet, but I’m going to work on it. Part of my personal desire to seek out creative passion is that I never want to be the kind of educator who grows stagnant and stops enjoying the chances to be artistically creative. I know that the idea of recapturing your creativity might feel like “too much,” but I urge you to reconsider and to think about how much better you might feel as a teacher if you do. So…will you join me? Will you make a commitment to recapture your creativity?